My Home and Garden: The beginning of the orchard overhaul. It has taken two days to get the orchard area of the garden to this point. 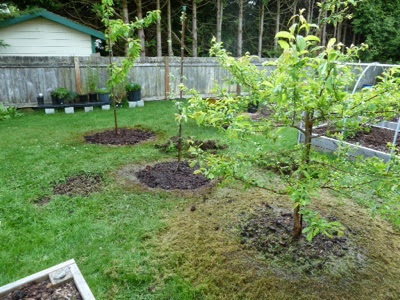 I need to remove all the grass and mulch the orchard area. 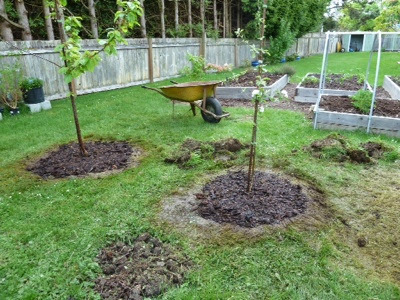 I started with the circle around each of the fruit trees. About three to four feet out. I broke the rule about never digging under a fruit tree as you disturb and cut roots near the surface. Between the lawn, quack grass and buttercups, I simply had no choice. So I dug as shallowly as I could. Used a trowel right near the trunk. And weed whacked a larger circle starting at the drip line. I filled each depression with beautiful horse manure. Then I will use vinegar to kill the grass as it comes back...and then finally a thick layer of mulch.